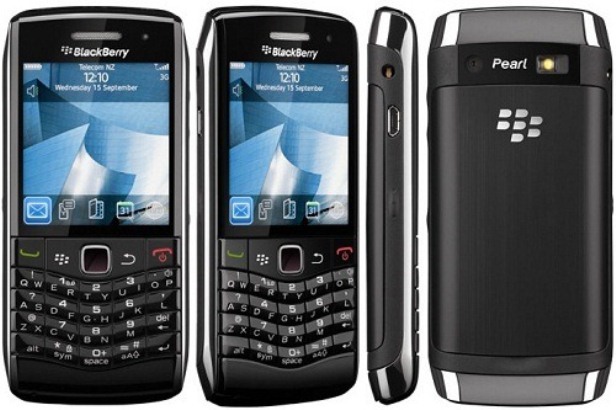 The BlackBerry Pearl 3G 9100 is a popular smartphone released in May 2010. Although not one of the most recent models, this one is appreciated for its features, such as the touch-sensitive optical trackpad, the included music keys, as well as the GPS support that it comes with. If you are the owner of this particular phone and you started experiencing software issues – unresponsive apps, slow starts and unexpected restarts, error messages or other unpleasant problems, you might be dealing with a virus. In such cases, we suggest to hard reset the BlackBerry Pearl 3G 9100. This is a very efficient procedure, as it is sure to remove the corrupt software that has been causing you problems before. In order to do this, all contents stored on the internal memory will be deleted and the BlackBerry OS will be re-installed from scratch. Coming with a Li-Ion 1150 mAh battery, this phone is equipped with both a 2G and a 3G network. Thanks to this, as well as the Wi-Fi 802 hotspot and the Bluetooth v2.1 that are included, connecting to the internet, as well as to other devices is very simple to do. Most apps are already included, while many others can be downloaded for free – the BlackBerry Maps are already stored on the phone. In terms of memory, the device has 256 MB space, but 32 GB more can be saved on the micro SD card in store. The first next move to make is creating a backup of all the documents you’d like to keep – whether these are media files, important contacts, apps or other data you wouldn’t want to lose, it’s easy to make sure you don’t lose anything. The micro SD card we previously mentioned comes in handy here, as you can transfer the files on to a folder there. Similarly, you can connect the phone to the PC and use the Desktop Manager application to make the same transfer. Click on the Options icon and go to Security Options. Click on Security Wipe and wait for the next screen to appear. Select the files you’d like to delete – to erase contacts and messages, check the box next to Emails, Contacts, Etc; to wipe all apps, check the second box: User Installed Applications; to delete files directly from the media card, select Media Card. 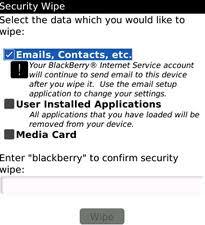 Type the password: blackberry and select Wipe to confirm. Wait for the device to reboot and don’t interrupt at any given time.